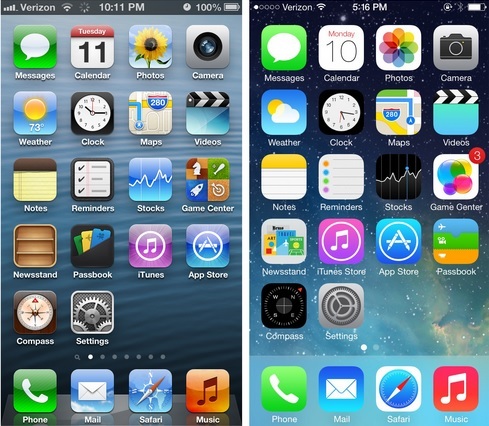 For IOS 7 the Apple Company claims that there are more than 200 new features in it. The map and the videos feature remained us about the window vista where the background shows the interface chrome. In the new multitasking view there is the touch web OS. The new lock screen may add some complexity. There is a backward swipe introduce to move backwards in apps. It’s time to say good bye to the glassy messages. Now the messages would be fat blue balloon with the fading of the past messages. Time stamp are hidden by default. Both Ipad and IPhone have the single integrated address and search bar. You can now shoot the photos in burst of mode by volume up and down option on your device. The photos session will update automatically by time, date and location. You can also create a collage of your images. In media app which is improvise in IOS7 you can now group your music and play according to your mood and atmosphere. The video apps get the new flat look. There are also new sounds in alerts and ringtones. The battery life is appear to be shorter as there are bundle of apps it enhance the performance of the software so it also effect the battery life as it drain quite fast. But you can boost battery life by switching off the extra apps which are not indulged in working. Now you can drop anything with the airdrop. It is the simpler way to share anything to anyone within no time only you have to do is to enable the application from the control center. If you say that both are made for each other it wasn’t the wrong statement. Both are designed to work together. The perfect example of this relation is the multitasking IOS 7 learns when you like to use your apps and update the content in the power efficient times. Browsing is bigger better and more beautiful with the IOS 7. It hides the unused apps and also the left and right swiping allow you to move forward and backward of the web pages so by this feature you will never slow down in your program. It seeks the permission to increase the 5mb of default space for an app to the previously 50mb of space will no longer work correctly and require the work around. Once the applications proceeds from 4 that are saved on the home screen the save slot will recycle and sometimes duplicated and the phone will be rebooted in order to fix that bug. The system continuously logging you out from the applications requiring them to enter their login credentials repeatedly. This issue was introducing due to new introduce refreshing feature. This can fix by disable the feature from the settings. For the IOS 7 the bugs can be fixed by updating the software that is IOS 7.0.3 and than the latest updates that are made by the manufacturers is IOS 7.0.4 by updating your software time to time you can fix your bugs that occur in the software.